Experience the skin-rejuvenating benefits of the Exclusive Winter Skin Set by South Korean skincare label, BeautyPro. The set combines three skin-regenerating must-have masks that address different skin concerns, that work in synergy to purify, nourish, exfoliate, clarify and rebalance your complexion with a range of nature-based ingredients and detoxifying extracts. An award-winning self-foaming mask that rids skin of daily dirt, oil and impurities. Applied closely to the contours of the lower face, the face mask is effortless to use. Simply apply to skin and the sheet will bubble to create a micro-massage for the visage. Soaked in Activated Charcoal and a rich AHA Complex, the cleansing mask detoxifies the complexion, which is ideal for refining pores and reducing excess oil on acne-prone skin. The treatment works in just 10 minutes, peeling away to reveal clarified skin that is visibly firm, refreshed and clear. A pre-soaked clay mask sheet powered by Activated Charcoal, Kaolin Clay and Volcanic Ash that deeply cleanses pores for an intensely refining treatment. Suitable for all skin types, the mask wraps around the natural contours of the face and comes in two separate pieces to ensure the T and U zones are fully covered. On application, the anti-ageing mask begins to harden and penetrates nourishing moisture and skin-brightening actives deep into the pores, delivering a thorough cleanse, visibly minimising pores for a firm and rejuvenated complexion. Another award-winning formula that restores balance to the complexion. Formulated with Active Charcoal to melt away bacteria and impurities from deep within pores, the detoxifying spot-busting face mask uses a hydrating blend of Deep Sea Water and Tea Tree to sweep away excess oil and maintain a healthy moisture balance. The treatment works to firm and tone the facial contours while boosting elasticity and brightening the complexion for a youthful-looking effect. After use, skin feels calm and comfortable and appears visibly healthy. Detoxifying: Remove the mask from packaging, unfold and place on lower half of face spread solution from the mask over the forehead area and can be applied to neck and décolletage. Wear for 10 minutes, allow mask to fully foam and then remove. Rinse off with warm water. Purifying: Carefully remove both the T and U zone sections from the packaging. Peel the transparent film from the T-zone section and apply to the face using the eye holes as a guide. Remove the white film from the mask. Once applied, adjust mask positioning if required. Apply the U-zone section of the mask following steps 2 and 3. Masks should overlap on cheeks. Leave for approximately 40-60 minutes or until mask has hardened. Carefully remove mask from the face and rinse with warm water. Black Peel™: Apply to cleansed, dry skin using clean finger tips or a mask brush, avoiding the hairline, eye and lip area. Remove after 20 minutes or when fully dry and elastic. Gently peel away mask in an upward motion. Rinse with warm water. Detoxifying: Aqua, Dipropylene Glycol, Glycerin, Methyl Perfluorobutyl Ether, Methyl Perfluoroisobutyl Ether, Disodium Cocoamphodiacetate, Hexylene Glycol, Cocamidopropyl Betaine, Betaine, Sodium Chloride, Sodium Polyacrylate, Xanthan Gum, Phenoxyethanol, Butylene Glycol, Paeonia Suffruticosa Root Extract, Centella Asiatica Extract, 1,2-Hexanediol, Pyrus Malus (Apple) Fruit Extract, Chamomilla Recutita (Matricaria) Flower Extract, Panax Ginseng Root Extract, Punica Granatum Fruit Extract, Hamamelis Virginiana (Witch Hazel) Extract, Rosa Centifolia Flower Water, Lavandula Angustifolia (Lavender) Extract, Caprylhydroxamic Acid, Morus Nigra Fruit Extract, Solanum Lycopersicum (Tomato) Fruit Extract, Melaleuca Alternifolia (Tea Tree) Leaf Extract, Glyceryl Caprylate, Ethylhexylglycerin, Citrus Aurantifolia (Lime) Fruit Extract, Citrus Limon (Lemon) Fruit Extract, Citrus Aurantium Dulcis (Orange) Fruit Extract, Vitis Vinifera (Grape) Fruit Extract, Charcoal Powder, Disodium EDTA, Parfum. Purifying: Aqua, Kaolin, Butylene Glycol, Bentonite, Polysorbate 80, 1,2-Hexanediol, Glycerin, Niacinamide, Adenosine, Magnesium Aluminum Silicate, Volcanic Ash, Silica, Stearic Acid, Xanthan Gum, Hydrolyzed Collagen, Allantoin, Panthenol, Portulaca Oleracea Extract, Morus Alba Leaf Extract, Morus Alba Fruit Extract, Pulsatilla Koreana Extract, Centella Asiatica Extract, Eclipta Prostrata Extract, Tromethamine, Dipotassium Glycyrrhizate, Ethylhexylglycerin, Disodium EDTA, Charcoal Powder, Mica, Bismuth Oxychloride, CI 77499, Ethyl Hexanediol, Phenoxyethanol, Parfum. 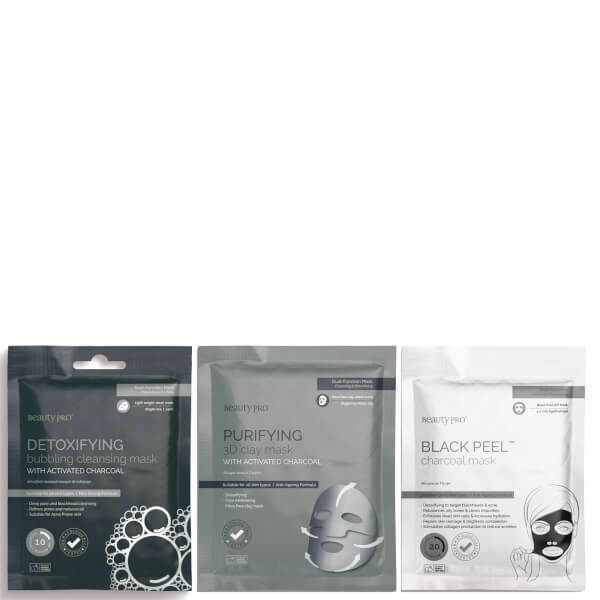 Black Peel™: Aqua, Alcohol Denat., Polyvinyl Alcohol, PEG-60 Hydrogenated Castor Oil, Glycerin, Cellulose Gum, Charcoal Powder, Phenoxyethanol, Chlorphenesin, Fragrance, Ethylhexylglycerin, Sodium Magnesium Silicate, Algin, Trehalose, Caprylyl Glycol, Polyglycerin-10, Polyglyceryl-10 Stearate, Polyglyceryl-10 Myristate, Disodium EDTA, Citric Acid, Sodium Dehydroacetate, Vitis Vinifera (Grape) Fruit extract, Butylene Glycol, Sea Water, Lavandula Angustifolia (Lavender) Flower Water, Fragaria Chiloensis (Strawberry) Fruit Extract, Ginkgo Biloba Leaf Extract, Citrus Aurantium Dulcis (Orange) Fruit Water, Camellia Sinensis Leaf Extract, Melaleuca Alternifolia (Tea Tree) Leaf Oil, Citrus Limon (Lemon) Fruit Extract, Sodium Benzoate, Potassium Sorbate, Parfum.